Yoga can be deceptively strenuous, hard work but the proven benefits are worth it. Yoga uses the resistance of your own body weight to develop balance, flexibility and strength. Many poses and sequences raise the heart rate, including popular standing poses such as the warrior sequences. When stress creeps in, exercise is an important lifestyle habit to foster she advises. For Dr Fraser swimming, bush walking, listening to music and playing the flute for personal expression sustain her personal wellbeing. Yet it is her daily yoga practice that is irreplaceable. Every morning Fraser does 20 minutes of yoga, complemented by a yoga class one to two times a week. “People say to me, ‘you’re so disciplined’, but I find it harder not to do it,” she says. · hand stand or shoulder stand. Props such as a chair, blocks, straps and a bolster provide support. She also installed ropes in her home, which she uses in the traditional Iyengar fashion to lengthen and stretch into particular poses. 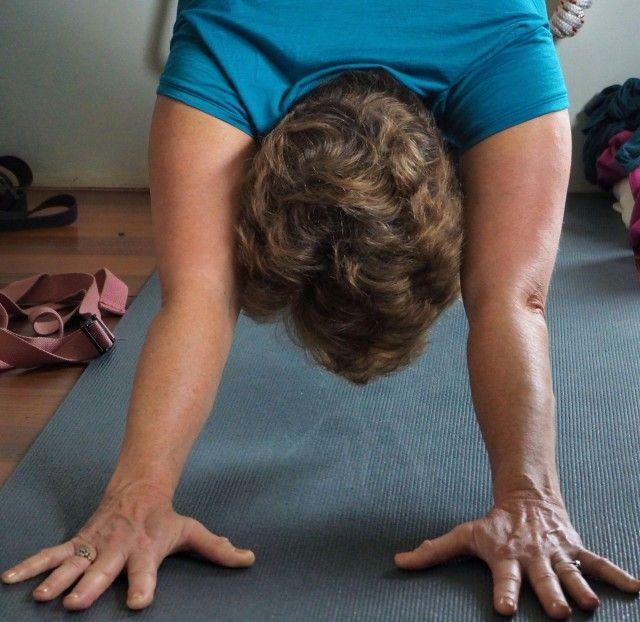 Dr Cathy Fraser regularly attends Judy Krupp’s The Yoga Room in St Ives, Sydney, where she practices a range of yoga including Iyengar. Dr Fraser is now a regular visitor to Griffins Hill Yoga Retreat.